The Biology of the Lion King: Seal culling: for conservation or clothing? Animal rights activists are up in arms over a proposed seal culling campaign that the Angolan government claims is necessary for fish conservation. While supporters claim that seal populations must be controlled in order for fishermen to survive, opponents argue that the people in charge really want to expand the business of selling seal skins and other products. Angola has a large grey seal - not sea lion- population, estimated at 27,500 in 2012. And it’s growing fast. From 2006 to 2012, seal numbers grew 14%. Each seal eats between 8kg and 30kg of fish every day, and Angolan fishermen claim that the marine carnivores are having a detrimental effect on fisheries. Knowing that, a well-managed cull makes some sense. The process of culling is stressful and pretty horrific for the animals. Nursing pups are taken away from their mothers and clubbed to death. And, as the director of the seal campaign at the International Fund for Animal Welfare claims, no scientific study has ever shown a seal cull to have a beneficial effect on fish stocks. Additionally, removing predators like the seal could have unexpected effects on sensitive ecosystems and would have to be handled very cautiously. Activists claim that politicians may want to expand the seal products business. 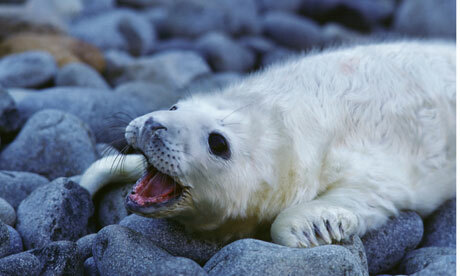 Asian markets sell products like seal genitalia, but the European Union bans all seal products, including skins. The ministry of the environment, which proposed the culling program, claims that it is just one proposed possibility to help fishermen and that it is exploring other options. Hopefully Angola will find another solution to help fishermen and will realize that it is rich enough in other resources that it does not need a seal products economy.